The poor thing has been living under it car cover for the past month or so whilst I got other things out of the way, but finally this weekend I uncovered her and went for a hoon. It started up first try with minimal cranking, and settled into a lovely smooth idle. I forget how great this car drives. Lots of down low power. Cruising along, arm out the window, just enjoying the drive. It’s what its all about. 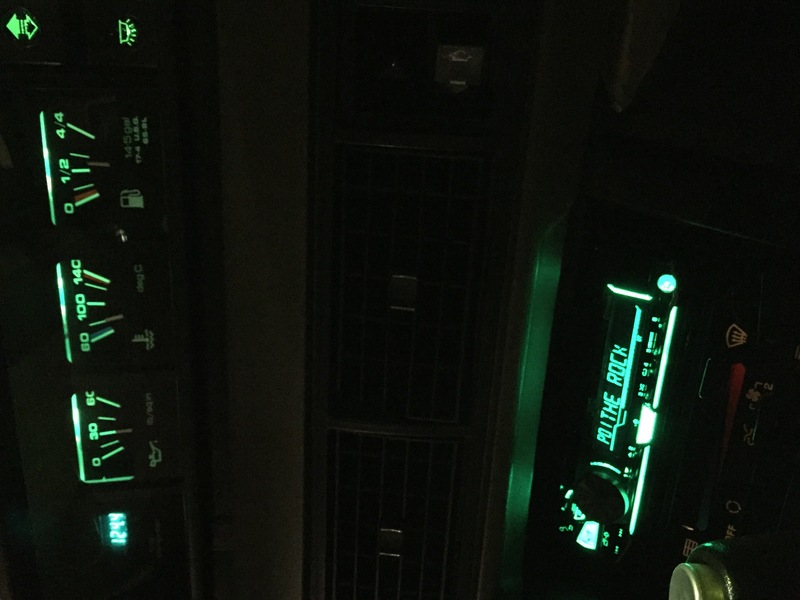 Stopped off at the supermarket last night and whilst the wife was getting some noms, I finally got around to matching the headunit color to the primo 80s green dash lights. Much better than the standard blue and white. I quite like the JVC unit, gives me unlimited options for color using RGB. Today I did some work on the tune. I have most things in the tune pretty well nailed down, but I have this persistent issue with warm starts. It takes a lot of cranking to start the car when warm, and usually needs half to full throttle to get it. After lots of trial and error the best I have got is that it will start in about half as many turns (about 4-5 turns of the engine now) but needs a jab of about half throttle to kick to life. I think I’ll live with that for now, at least I wont kill the battery or starter now. The new water pump is doing its job, temps are stable and the heater is working. I removed the intake snorkel off the front of the air filter box again, as it made an ugly whistling under acceleration. Now im back to just a loud woosh. A very disjointed post, but a quick update. There is still work to be done on the Rover, I just need time and space to do it. The Zeal is taking up most of that at the moment.